Q What inspired you for this book? A.Books are mediums in which one shares his/her emotions, thoughts and feelings with his/her readers. Most book readers are very passionate about their interest. So the feeling of being part of this family is what really inspires me. 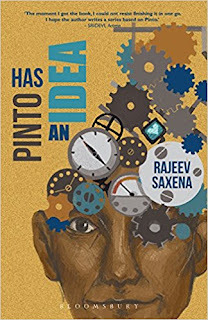 The main inspiration for my book ‘Pinto Has An Idea’ came from its main character Dr. Pinto, who I never met in real life but he’s been so close to my heart in my imagination since my childhood. Dr. Pinto is a character who can exist in real life. He’s a character who might be there somewhere as we speak. I wanted to give this character a shape, to bring the story out which had been inside of me for so long. I was just waiting for the right time and opportunity and here we are. Q. What was the hardest part of creating this book? A. As a new author, the most difficult part was finding a publisher. I think I can write a whole book about that. I was lucky that I found a reputable one, who’s well known across the globe. The second most difficult thing was to bring out the story to perfection at all times. When the manuscript is with you and awaiting for a publisher’s acceptance, you keep on ‘improving’ it so it becomes a never ending process till it reaches its destination i.e. to a publisher. To some extent it’s a blessing in disguise as the end product becomes better but at the same time there should be an end to it. As a first timer, I think another difficulty you face is that there should not be too much ‘you’ in the book. It’s extremely difficult to avoid bringing your personality into the novel. It’s just the matter of perception. For some readers it may be very natural and for others it’s good or bad. To be honest I have used some of the surroundings and settings around my plot which have been very realistic and associated with me somehow. While doing so I’ve paid very detailed attention to craft my characters in a fully fictional form. Q. What do you hope people gain from reading it? A. Lately, young readers have seen several books about college romance. Most of them are written for light reading and entertainment. I felt that I should do something a little different. While I have made my book entreating and humorous, I’ve kept a very high standard of the intellectual part so I’d describe it as an intellectual and entertaining read. Readers would be able to associate themselves with Pinto and Lavanya. They’d also find that everybody has a Pinto and a Lavanya in them and this book will help them achieve that nirvana through ‘enlightenment’. Readers are the final judge. Q. What are your ‘secret powers’ and some you wish you had? A. I think I have the ability to craft characters very close to reality yet a pure work of fiction. Characters, stories and plot come to my mind in a fraction of second. So I can virtually write one book a month, really, not exaggerating. 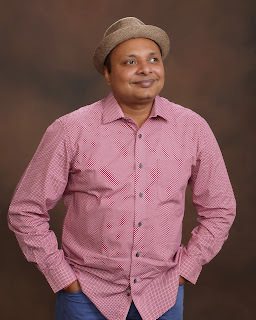 As a first time author, I need a lot of publicity and marketing so I wish I had some kind of magic marketing capability or some magic wand so I could spread the word about my book to everyone in the world. I’m confident if I can get the book to readers’ hand so they get a feel of it, they’d buy it. But the biggest challenge is to increase the reach. Q. How you become a published author? Any inspiration? A.Can corruption be good for a society? You’ll find the answer in my book, how? Similarly though I hated self-publishing route, it did help me write the book to become a published author. When I was writing the book, I decidedno matter what it takes to find a good publisher, I’d not give up. At the same time I had the hope that I could self-publish my book if nothing works out. So at least my efforts was not wasted. Finally I got one of the top publishers for my book, the same publisher that published Harry Potter. Q. Did you get any ideas for your books from your own dreams? A. Fiction is all about dreaming. It may not be through dreams at night while sleeping alone. You could be daydreaming as well. You may sometime call it imagination as well. For writing a book you have to be a dreamer. I’ve tried that my dreams are close to reality as much as they can. Q. Why should we buy your book? A.It really doesn’t matter whether you are a keen reader or a passive one, this book will be of your interest. Just buy it for humour and intellectual entertainment and to read something different which you might not have seen in the market earlier.